This obituary in German has been lurking in my drafts folder for too long. Christian Peters lives in Köln, Germany (Cologne) and keeps in touch regularly. I am not sure if he met up with Nick on his walk but I am sure Christian will tell us. 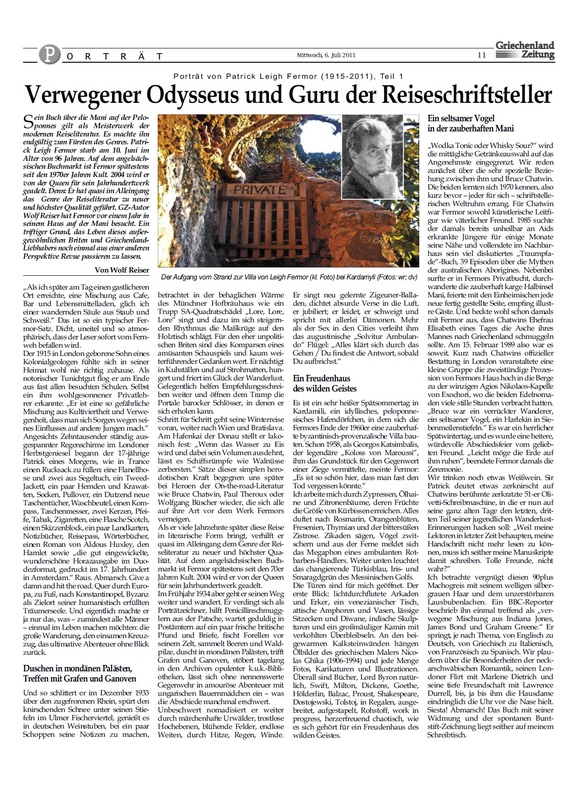 After Paddy’s death I tried to publish an article in the German newspaper in Athens called “Griechenland-Zeitung”. But a couple of days before my article reached the editorial staff, they had published a much better one by Wolf Reiser. The chief editor was so nice to send me a copy of the first part of the article. Maybe that is interesting for the “German section” of your blog. I am really pleased about your blog, day by day. Next year I am gonna have a sabbatical in order to complete my dissertation on skateboarding . I am planning to write parts of it either in Kardamyli or in Sfakia /Crete, the region Xan Fielding has been writing about which is kind of my Greek homeland. Click the image to enlarge the text. This entry was posted in Paddy's Death and tagged German, Nick Hunt, Patrick Leigh Fermor on September 17, 2012 by proverbs6to10. In smaller print above the headline it gives PLF’s name and years lived, then Teil 1 or Part 1. Am I misreading or is there another part? George – you are correct. We are looking for Part 2 as I write! I remember that sign. Though I can understand the reasons for it, it struck me as at odds with the properties Paddy visited on his walk. There was no such sign at Dumbleton, but his house was quite some way off the road and one had to pass by Rita’s house (Paddy’s housekeeper) and another as I recall.